Now the dust has settled and the hard miles are done it is awesome to see that the 1983 bmw has made it through the grueling 2012 Australasian Safari. How hard was day six? Here is what Jason wrote about the leg over on Adventure Rider. “Yesterday was the Kalbarri Death March, haha.. It started off well, nice fast 100k stage, fast and flowing. Second stage was a reverse of an earlier one, and halfway through I lost the back brake cable. Ironically, brakes allow you to ride faster. At first I used some fence wire to bodge it, but could never really get enough tension so it was really just to hold the brake pedal up out of the way. As someone pointed out, its a BMW and therefore doesn’t really need a rear brake. Just downshift and BBBWWOOOAAA down you go. Stage three was a 200k that at 80ks into I hit a dip and broke the left footpeg off. I found out later this is where the #14 yamaha crashed, and also Manuel. I went back and found the footpeg remains, and someone later pointer out it’s a BMW and comes equipped with two substitute footpegs sticking out from each side. I used some more fence wire to sew the peg remains back on the bike, but it just barely worked. Not proud to say I borrowed the footpeg from #14 bike which was there, in case the bodge job I did failed somewhere over the rest of the stage. It only kind of worked, I was forced to sit most of the rest of the way, or stand on one foot, and when I got back to camp I gratefully returned the borrowed yamaha peg. Jason’s effort was rewarded with the ‘Andy Caldecott Award’. 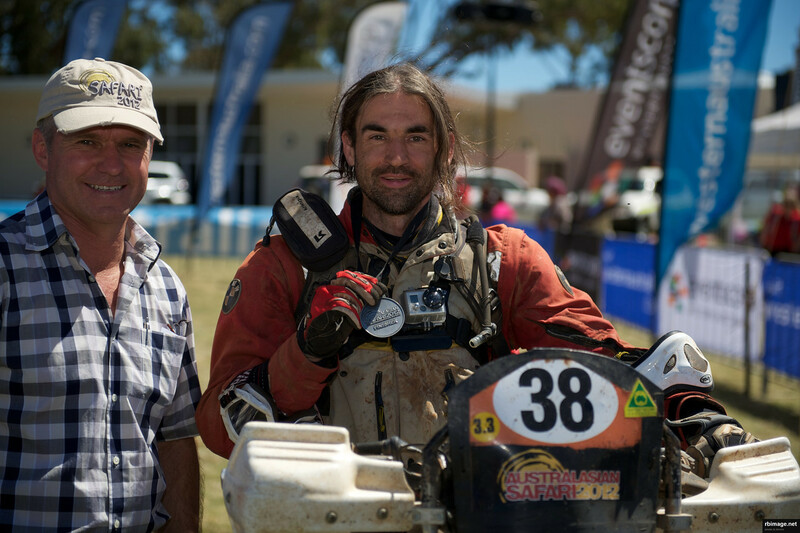 Andy Caldecott is an Australasian Safari legend who passed in the 2006 dakar rallye. Ross Briggs snapped this picture of Jason with his finishers medallion. Granted, Team Rooney may not have finished the Safari in the top three. But the fact that a 1983 Bmw that Jason had never even ridden only days before the event was able to conquer such a grueling event is testament to the man and the machine. Well done Jason and Paul, I hope this blog provides you with a useful record of your extreme undertaking! For anyone that wants to read the full adventure I have posted the whole episode here reconfigured into chronological order. Next Post Double the Dust!